My favorite pottery that I do is thrown on a Leach-style treadle wheel, which replaces the regular movement of the electric wheel with the rhythm of the body. Once thrown on the wheel, many of the forms are altered and manipulated. Self-designed, hand-carved stamps may be applied to add distinctive texture and enhance the pot’s appearance. The pots are glazed by a combination of dunking and spraying. Firing takes place in an oxidation atmosphere of an electric kiln. The result is unique, functional pottery that brings beauty into our kitchens and living spaces. My love for clay started at Winthrop University where I earned my BFA in the Ceramic Arts in 1992. In 1994 I moved to Cincinnati Ohio where I became involved with the Cincinnati Clay Alliance and was also active in the Art Guild. I taught Throwing and Handbuilding classes there and worked in a local gallery. In 1999 I moved to South Carolina and set up a home studio and taught classes at the Clayground in Charlotte. In 2005 I took over the Clayground and started my own business that is now The Whirling Wheel. In addition to teaching I display in galleries and sell at art fairs. I participate in the Carolina Claymatters Guild and go to many pottery workshops, including a course in Italy in 2005. 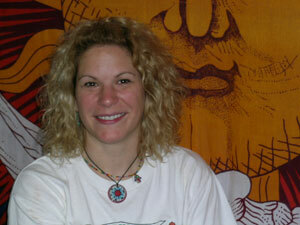 Celena was awarded Charlotte Magazine's 2009 Best of the Best Award for Visual Artist. I'm Kyla McDaniel, an up-and-coming artist in the Charlotte area. I officially began my journey as an artist in 2001 at the University of North Carolina at Charlotte, working toward my Bachelors of Fine Arts in Ceramics. I worked primarily in abstract ceramic sculpture, then moved onto the wheel. I also enjoy a variety of mediums including photography, printmaking,and fiber. 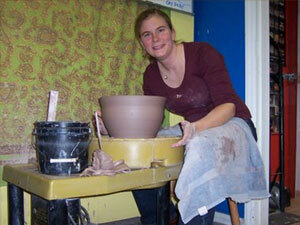 I am currently creating pottery and sculptures at the Whirling Wheel studio in Charlotte. I am expanding my portfolio while finding my own style in the art world. In an attempt to branch out, I am selling some of work at local shops and showing in some of Charlotte's fine art galleries. I never miss a chance to see art all around me-in nature, in people, in every day things. I want my art to reflect what is going on around me and inside me. Making art is a way for me to connect and reconnect with the world, myself and God. Some recurrent motif's in my artwork are mood disorders, nature, and Christian principles. I hope to express God's love through my art and bring glory to Him, as He has blessed me with a creative spirit. I was born 1973 in Ulm, Germany and spend my childhood and early adult life there. After high school (Gymnasium in Germany) I went to university in Bamberg and got my Masters Degree in German Language and Literature with concentration in publishing. During my years at University I met my husband Charles. We got married and moved to the United States in 2000. After living in Virginia and New York we came to Charlotte in 2004. Here I rediscovered my desire to do pottery. I signed up for wheel and hand building classes at The Whirling Wheel and have stuck with it ever since (except for a short baby break). In ’07 Celena offered me the chance to become a hand building teacher in her studio. I have always been a very creative person and worked with different mediums through high school and college. I have done various sculptures in clay during school but then focused more on painting and drawing (water color, acrylics and charcoal). I also love to decorate my house, sew my own pillows, curtains, blankets, slipcovers and work in the yard. My mind is constantly working on possible projects and it drives me crazy when I can’t seem to find the time to realize them. I am a stay-at-home mom for my daughter Lena and our three cats Pepper, Flint and Nele. The Whirling Wheel provides me with an often needed place to relax and restore my sanity. I absolutely love teaching! It is exciting to see my students grow in their work, become more secure in their techniques and find their own creativity!